Taiwanese PC maker MSI says it’s planning to launch three WindPad 10-inch tablets in June, mainly targeting business and enterprise users rather than consumers. Two of the tablets—sporting Intel and AMD processors, respectively—will run Windows 7, while the third will sport an Nvidia Tegra 2 processor and run the tablet-optimized Android 3.0 “Honeycomb.” MSI says it is targeting a June 1 launch date, and the Android device has a target price tag of just $399—which puts it well below pricing for products like the Motorola Xoom, and even below the cost of Apple’s current bottom-of-the-line iPad. 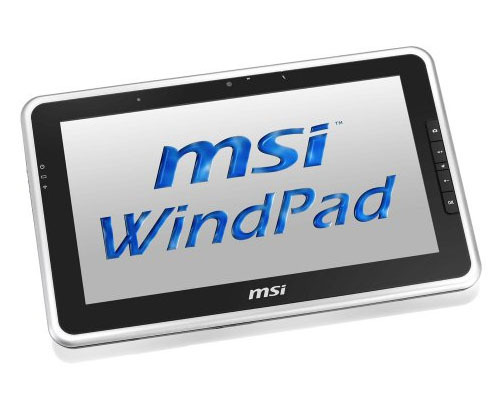 MSI says the WindPad with the Intel processor will have pricing starting at $549. The company didn’t offer pricing for the AMD-based WindPad, but it should land in between the Android tablet and the Intel-based Windows 7 WindPad. Rather than targeting consumers, MSI is aiming all three tablets at business folk—particularly those who have standardized on Windows and haven’t answered to the siren call of Apple’ iOS devices. MSI is betting businesses will be willing to invest in Windows-based tablets that integrate cleanly with their existing Windows infrastructure, rather than spend more money for tablets running a separate Apple operating system. Of course, the downside of Windows 7 tablets is that Windows 7 isn’t exactly a tablet-optimized operating system: one need only recall Microsoft CEO Steve Ballmer struggling with an HP Slate during his keynote at CES 2010 to understand the downsides. The Intel version of the WindPad tablet will feature an Intel Atom Z530 processor running at 1.6 GHz, 2 GB of RAM, 32 GB of flash storage, 802.11b/g/n Wi-Fi and Bluetooth 2.1+EDR wireless networking, a mini-HDMI port for connecting to HDTVs, an integrated webcam, an SDHC card reader, and a single USB 2.0 port. Reports have the AMD version running a dual-core C-50 chipset. The Intel version will apparently ship with Windows 7 Starter Edition, although there are reports the AMD version may ship with Windows 7 Home Premium.